Beach Dad’s grillin’ up some pancakes! 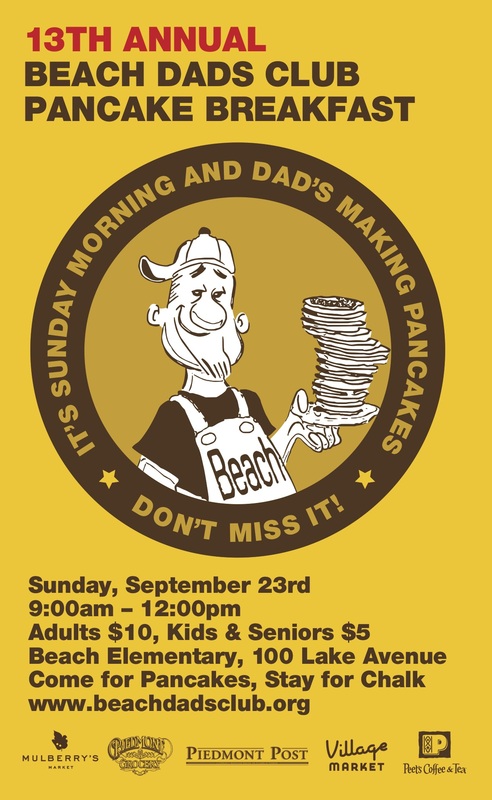 Come out and enjoy a delicious Dad-cooked breakfast on Sunday Sept 23 as the Beach Dad’s Club hosts their 13th Annual Beach Dad’s Pancake breakfast! Homemade buttermilk, blueberry, chocolate chip, or oatmeal pancakes, plus sausage, bacon, fruit and Peet’s coffee. Yum!! Come and get it!! A big thanks, as always, to the local businesses who make the event a success: Piedmont Grocery, Mulberry’s Market, Village Market, Peet’s Coffee on Piedmont Ave., and the Piedmont Post. The Pancake Breakfast will be followed by the Chalk Art for Peace Project sponsored by PAINTS. Kids and adults can purchase chalk and a square on the blacktop to decorate and enjoy.